HATBOX HANDBAG! 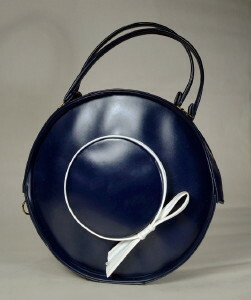 NAVY BLUE 1950's VINTAGE HANDBAG WITH WHITE TRIM - HAT SHAPE! Fifties vintage hatbox handbag in the shape of a hat! Navy blue slightly textured vinyl with white trim. Round hat shape. Raised crown effect with white hatband and bow. Double self handle. Roomy interior, tan vinyl lining. Brass Petal zipper closure, ring pull and hardware. Playful vintage handbag, bound to be noticed! EXCELLENT condition. Shows very minor wear at exterior, slight dimples at sides and some inconsequential marks and wear to interior.